Every summer around this time of year, I look forward to checking out the sights and sounds of Edmonton’s local exhibition formerly known as Klondike Days. Its very name conjures childhood memories full of non-stop carnival rides, piping hot corn dogs and the sweet smell of freshly spun cotton candy. The name Klondike Days was originally brought in by exhibition organizers in the 1960’s and the Klondike gold rush theme was enthusiastically embraced by the public. I’ve always wondered what our local historical connection to the gold rush really was. Is there really gold to be found in the river valley? 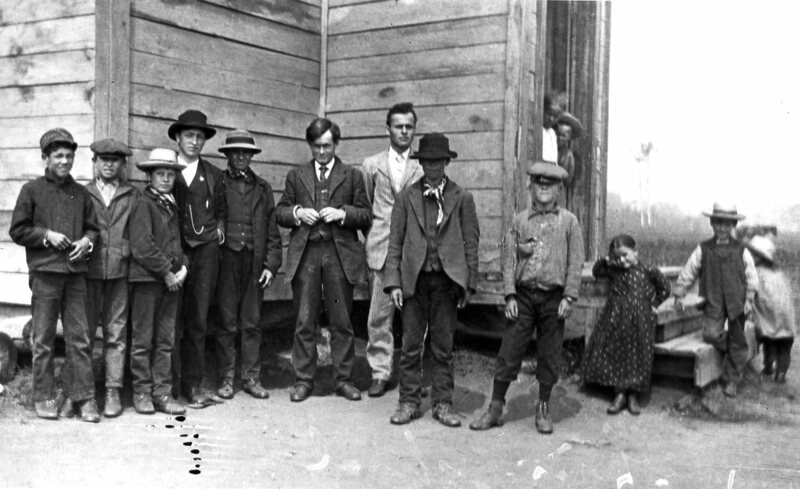 Students at Victoria School, circa 1910: Left to right Frank Whitford, Fred Kuzemsky, unidentified, Wasyl Kotyk, Wayne Kozub or Esopenko, teacher Mr. Rowbottom, Demetrius Ponich, Metro Starchuk, David Thompson, Elena Brusanowsky, Wasyl Brusanowsky [in doorway] and three unidentified at far right (Photo: Rev. D.M. Ponich Collection, Alberta Culture and Tourism). Descendants of settlers from Alberta’s historic Victoria Settlement district, and enthusiasts of Alberta’s history generally, are invited to take part in a special gathering and genealogical symposium on the 6th of August 2016 at the Victoria Settlement Provincial Historic Site. 9:00-9:30 Set up of tents, tables, registration, displays from participants. 9:30-10:00 Registration – meet and greet. 10:00-10:30 Ross Stromberg: Program Coordinator, Alberta Culture and Tourism. 10:30-10:45 Elaine Breadon Peiche: Victoria Home Guard Society. great-granddaughter of Rev. George McDougall. 12:30-1:00 Enjoy your picnic lunch and mingle! historic Riverlot #3 – with a suitcase full of found treasures! 3:00-3:30 Steven Bentley: Historian and genealogist with some ‘Whitford’ stories. 3:30-4:00 Group photo and closing. 4:00 Carpool to cemetery for those who wish to explore it. 5:00 Victoria Settlement Historic Site closes. BONUS: There will be THREE genealogical consultants on site to help with family histories! Steven Bentley plus Bill and Sandy Macdonald. Please bring your picnic lunch! AND, your family history, stories, research to share. Everyone is responsible for their own entrance fee to V.S. ($5.00 per person). 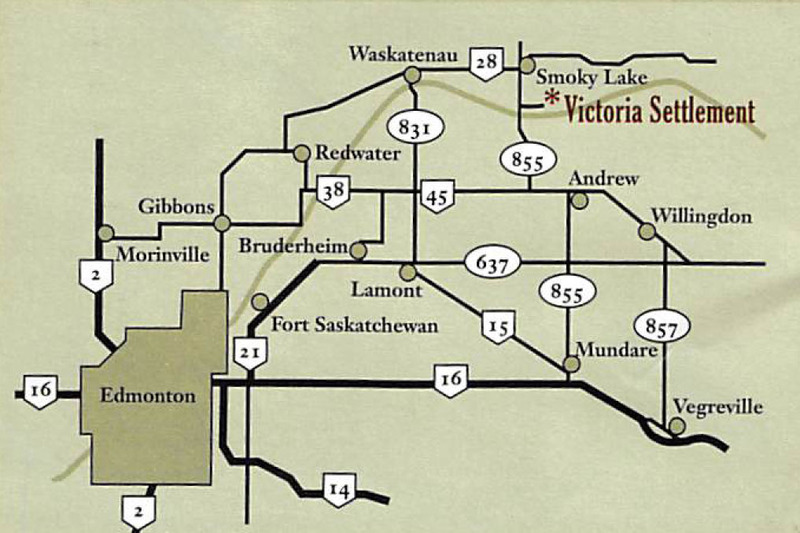 If you plan to join us, a quick email to victoriasettlementgathering@gmail.com would help us with our planning. WE CAN’T WAIT TO MEET ALL OF YOU! When St. Mary Reservoir in southern Alberta was filled in the 1950s, no one knew that it submerged an incredible record of life from 13,000 years ago. That record, including footprints of mammoth, camel, and horse, was recently exposed – the internationally significant site is now informing opinions about the role humans played in the extinction of Alberta’s ‘megafauna’. 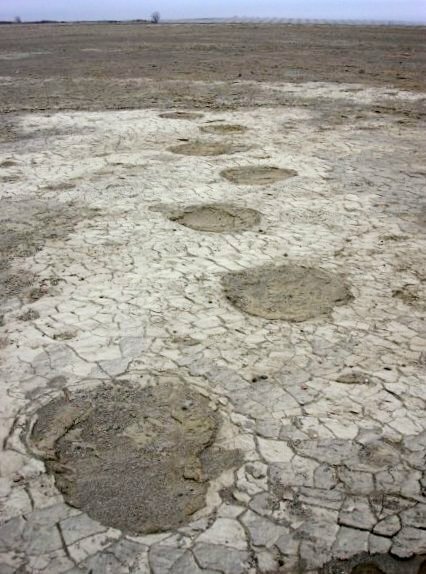 Rare and information-rich trackways from lumbering mammoth were revealed by scouring winds at St. Mary Reservoir (courtesy of Shayne Tolman). 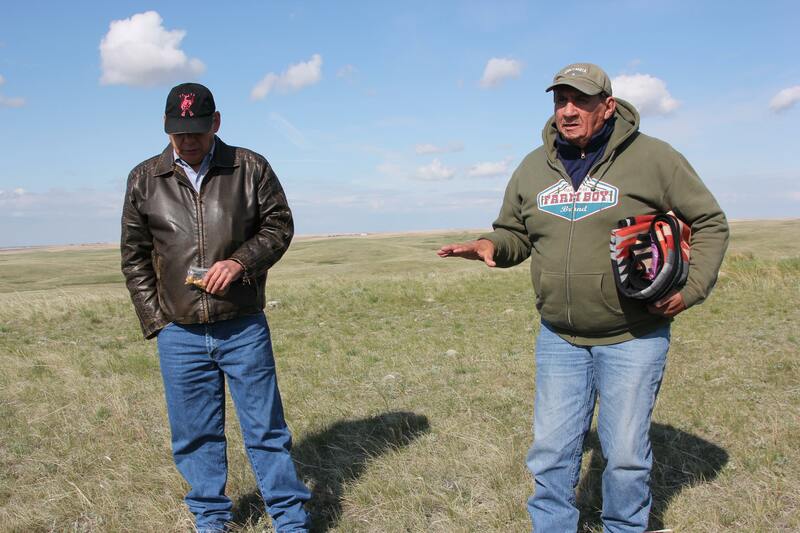 Shayne Tolman, a teacher from Cardston, is responsible for drawing attention to St. Mary Reservoir and Wally’s Beach, a site complex on an ancient island in St. Mary River that is currently being investigated by Dr. Brian Kooyman and a team from the University of Calgary. Archaeologists have discovered that the menu of some of Alberta’s oldest humans included megafauna like camel, horse, and perhaps mammoth. Over six thousand artifacts indicate that people were hunting big game at a time when these animals were likely struggling to cope with climate change. Did human hunting lead to megafauna extinction or are warming temperatures to blame? Many researchers argue that pre-contact human populations were too small to impact big game while others suggest that targeted hunting patterns among small groups could have big consequences. 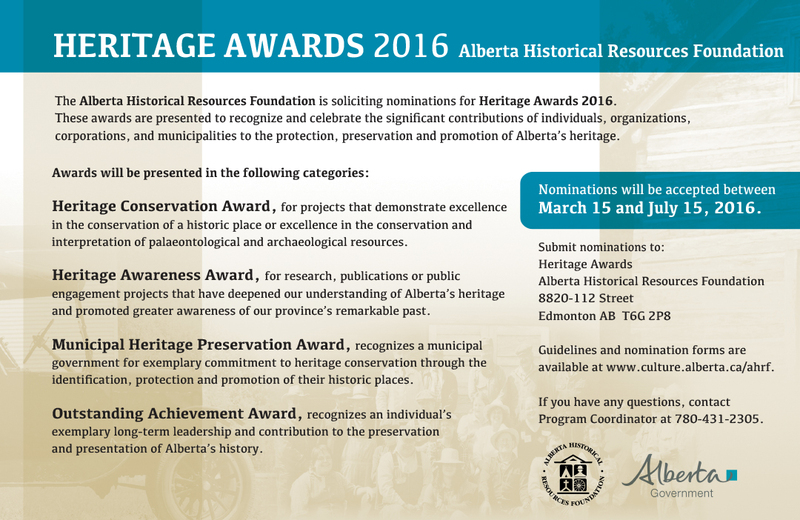 Nominations for the Alberta Historical Resources Foundation’s Heritage Awards are still open. Help us honour and celebrate the outstanding accomplishments of individuals, organizations, municipalities and businesses who have contributed to the preservation of Alberta’s heritage. Deadline for nominations is July 15. The awards ceremony will take place on October 14 at the historic McDougall Centre in Calgary. For a copy of the guidelines and nomination form, click here or contact Carina Naranjilla at 780-431-2305 or Carina.Naranjilla@gov.ab.ca. More information is also available at http://www.culture.alberta.ca/heritage-and-museums/grants-and-recognition/heritage-awards/.